Nina Fagerstrom and Flower. Photos ©Sportfot. Mill Spring, NC – May 14, 2015 – Competition continued today at Tryon Spring 5 with additional hunter and jumper action across the Tryon International Equestrian Center (TIEC) venue. Nina Fagerstrom (FIN) and Flower raced to the top of the $15,000 Suncast® 1.45 Welcome Stake, taking home their second victory in two short days of competition. Competition at Tryon Spring 5 continues through Sunday, May 17 and the Tryon Spring Series will conclude on June 7. Fagerstrom and Flower have had a strong start to their first week at TIEC, taking both the $1,000 Nutrena 1.40m Open Jumper class yesterday and the $15,000 Suncast® 1.45m Welcome Stake this afternoon in the George H. Morris Stadium. Fagerstrom, who was extremely pleased with her rounds aboard Flower the past two days, was delighted with Guilherme Jorge’s course design in this afternoon’s class. The pair finished their first trip clean in 73.281 seconds and finished four seconds faster than the closest competitor in the jump-off, in 34.901 seconds. Flower has handled the atmosphere at TIEC very well, which Fagerstrom believes is a testament to the mare’s growing maturity and has made her very rideable so far this week in competition. The class today prepped several combinations for the biggest test of the week, the $50,000 Tryon Grand Prix on Saturday evening and Fagerstrom commented that it helped her to mentally prepare for what the duo will see on Saturday night. Fagerstrom also had another ride in the class, Hot Topic, who is green to the level but is just as talented as her barn mate, Flower, and gained valuable experience at the 1.45m height today. Kyle Timm and Georgie B finished in second with a time of 38.193 in the jump-off with Hunter Holloway and I Love Lucy in third, finishing the jump-off in 34.827 seconds with four faults. Hunt Tosh has staked his claim at TIEC this week, placing towards the top in majority of his classes, with a series of impressively scored rounds. Aboard Ken and Ceil Wheeler’s Largesse in today’s $1,000 USHJA Pre-Green Incentive, Tosh bested the class of fifteen entries to take home the first major class of WCHR Week. Largesse has the potential to be a top mount for Tosh in the coming years and today’s win in the Pre-Green Incentive with a score of 89 on their first trip, solidified Tosh’s feeling about the impressive gelding. Tosh also finished in second and fourth places aboard The Wheeler Family’s Valhalla and Troubadour respectively. Daniel Geitner finished in second with Janet Peterson’s Raffle. Competition continues at Tryon Spring 5 tomorrow with the $10,000 USHJA International Hunter Derby beginning at 6pm in the George H. Morris Stadium alongside the $25,000 Under 25 Grand Prix, which will also be held in the George H. Morris Stadium beginning at 12pm. For more information on TIEC and a full event schedule, please visit www.tryon.com. Please “Like” the TIEC Facebook page at www.facebook.com/tryonresort to be eligible for various contests and promotions. Mill Spring, NC – May 13, 2015 – Concluding the first day of competition at Tryon Spring 5 in the George H. Morris Stadium at Tryon International Equestrian Center (TIEC), Nina Fagerstrom (FIN) and Flower produced two fast and clean trips in $1,000 Nutrena Open Jumper 1.40m class to take home the win. Kyle Timm aboard Calida 55 finished in second with a time of 40.149 seconds followed by Daniel Geitner and Kenwood placing third, adding four faults to their time of 37.302. The Tryon Spring 5 competition continues through Sunday, May 17. The Tryon Spring Series will conclude Sunday, June 7. Flower, Fagerstrom’s top mount, had a lengthy vacation after the season in Florida and Fagerstrom couldn’t help but be impressed with the way the mare performed in her first class back in a competition setting. The duo finished the first round clear in 73.15 seconds and raced around the jump-off to finish faultless in 39.365 seconds. The course designed by Guilherme Jorge of Brazil gave riders the opportunity to choose bold tight lines or stay conservative for experience and familiarity in the stadium early in the week. Fagerstrom was pleased with the course and felt it suited her mare well as they prepare for the $50,000 Tryon Grand Prix on Saturday night. “I’m really looking forward to the Grand Prix on Saturday night with her. She experienced jumping under the lights at [WEF] this year and in the beginning it was a difficult atmosphere for her and I really think she learned a lot there and it will be great to test it here,” said Fagerstrom. The duo has been partnered for three years and a half years and Fagerstrom feels she has created a very special relationship with the feisty mare and that bond has helped to better their performances in the ring. 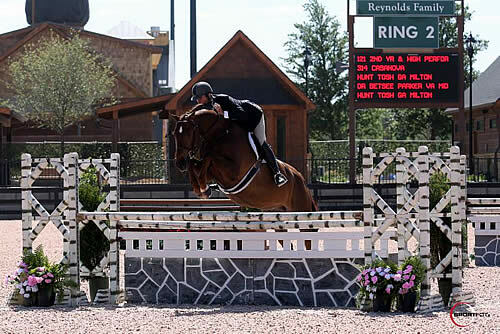 Beginning WCHR week in great form, Hunt Tosh and Dr. Betsee Parker’s Casanova showcased their talent in the Reynolds Family Ring today, taking all three classes in the combined division of Second Year Green Hunters and High Performance Hunters at Tryon Spring 5. Tosh and Casanova proved unbeatable in the first day of World Championship Hunter Rider (WCHR) week competition at TIEC. The division will conclude tomorrow with Champion and Reserve Champion honors being awarded to competitors. Tosh, aboard the beautiful liver chestnut Dutch Warmblood gelding (Carolus II x Sally), captured high scores in both over fences classes, with an 86 and 88 respectively. The pair also won the under saddle portion of the division. As WCHR Week continues to draw competitive entries at Tryon Spring 5, Tosh noted that the venue serves as a great place to give a number of different horses experience before tackling the larger classes offered at the end of the week. 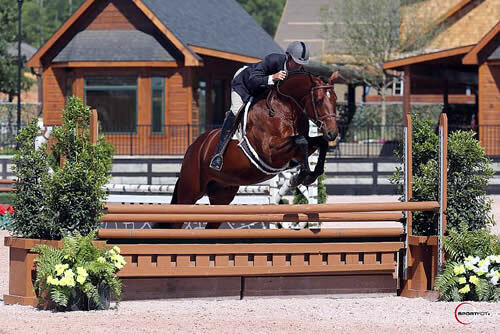 Competition continues at Tryon Spring 5 with additional WCHR classes including the $1,000 Pre-Green Incentive, $10,000 USHJA International Hunter Derby, and the $50,000 Tryon Open Hunter Classic. The first of the “Saturday Night Lights” Grand Prix series will be held Saturday, May 16, with gates opening at 5pm and competition beginning at 6:30pm. For more information and full results, please visit www.tryon.com. Anne Kursinski and MTM Motto. 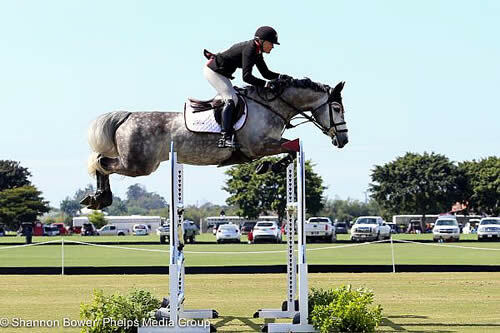 Wellington, FL – February 18, 2015 – Today Anne Kursinski illustrated once again why she is one of the most successful show jumpers in the United States, claiming the top prize today aboard Hay’s Investment Corporation’s MTM Motto in the first 1.30-1.35m jumper class at The Ridge at Wellington’s Turf Tour. The weather started out a bit less than ideal Wednesday morning, but that didn’t stop several of Wellington’s top competitors from trying their hand at Nick Granat’s courses in between the rain drops. As the afternoon progressed and the sun brightened everyone’s day, competitors flocked to the pristine polo fields of the International Polo Club (IPC) Palm Beach. Anne Kursinski posted a very fast time of 39.071 to win the first 1.30-1.35m class with MTM Motto. Despite being only the third pair to go double clear, Kursinski and the grey gelding blazed around in a time that held for the entirety of the day against a field of 31. Nina Fagerstrom did her best to claim the top prize in both classes, but fell just short by stopping the clock at 39.173, a mere tenth of a second off of the leader. Jeffery Welles was the second double clear of the day, and finished in third with a time of 39.660 aboard Calais. The second 1.30-1.35m class was won by Nina Fagerstrom, riding Finca Horses Inc.’s Hot Topic. She posted a time of 32.684, nearly two seconds ahead of second place Conor Swail who posted a time of 34.650 on Simba De La Roque. Paul Yanke on Chill Haze stopped the clock in 30.585, but an unfortunate rail down at fence three put him into third place. The second ring saw a number of talented horse and rider pairs competing throughout the day. Competitors were developing their young horses by providing them with valuable experience on the turf. Michel Ismalun, three star level member of the course design team from World Equestrian Games 2014, a world-renowned course designer and a director for Classic Champions Inc., built the young jumper courses in the adjacent ring to the 1.30-1.35m jumpers. The course proved to be very inviting and educational for each division, allowing the younger horses to go forward and gallop while on the turf. Martha Redman won the first 6-year-old class aboard Expresso. Peter Lutz claimed the top prize in the 6-year-old YJC Qualifier Class riding T Zero. Triumph was successful in the first 7-year-old class, ridden and owned by Gustavo Prato. Paul O’Shea rode Hayley Patmore’s Peninsula Riversong to the victory in the second 7-year-old class. Samantha Johnson won both low jumper classes, riding Rene Johnson’s Artemis. Sarah Wayda claimed both second place ribbons in those classes with Rian Miller’s Contentus. Baer Hendrix won the first medium jumper class on Equiagrix SAS’s Tip Top Cool. Debbi White topped the leader board in the second medium jumper class on her own Basil Hayden. Friday’s events promise to be exciting, with the $15,000 1.40m Grand Prix running from 8 a.m. until 4:30 p.m. Beginning at 8 a.m., the second ring will have Low Schooling Jumpers, with two classes running simultaneously with open cards until noon. Medium schooling jumpers will kick off at noon with two classes running with open cards until 4:30 p.m.
Week 8 of the Ridge at Wellington’s Turf Tour will also take place at The International Polo Club, located at 3667 120th Avenue South in Wellington, FL 33414. The show entrance will be off 120th Street between Lake Worth Road and Pierson Road. The Ridge would like to thank Dover Saddlery for their support of the 12-week series as the cooler and banner sponsor, and they would also like to announce their most recent jump sponsor, Panthera, the leaders in wild cat conservation.